Today cohort 11 started our journey with Dr. Jay Marks and Naomi Khalil. I didn't know what to expect since I have never participated in one of Jay's professional developments. I can say, I left with my head spinning. It was difficult, but in such a good and thought-provoking way. The purpose of this post is really to highlight the core meaning of day 1 and also share the strategies that we went through. I find I spend a lot of my PD time thinking about the information being presented and discussed. I take time to process it, analyze it, and then form ideas/thoughts/opinions, which is often difficult in the moment (for me). Day 1 forced me to step outside of my comfort zone and share personal pieces of who I am and articulate my cultural background and identity. Sound scary? Uh, yeah. It was! Very necessary work for what I think will lead us into day 2. We started out with a Cultural Proficiency Receptivity Scale in which we rated where we fell on various statements such as, "I am committed to creating both an educational environment and learning experiences for our students that honor and respect who they are." At the end of the inventory we added up our scores and did a reflection on our results. This was the first and one of the only activities in which we would be doing on our own. I think it set the tone for some of our ideals as an educator in relation to culture. We immediately went into the circle activity, which I quite like as an icebreaker. It's an introduction to who we are and then when one person in the group finds a 'link,' they come up and link arms with that person. You do this until you form a circle. Depending on the information shared can lead the group into a discussion. This activity forces the participants to find a connection with another person, then share why it's a link and more about yourself. Mine was about being adopted. It felt strange to make that my linked information because I never talk about it, but as I have found through the process, it makes up a significant part of my cultural background. As a group (Royal Oak team) we listed out norms for our group and the work. We had 8 items and we reduced it down to the top 3 in which we would share with the whole cohort. Our three were respect, active engagement, and support system. We went around the room and each group added their number 1 and justified it and then number 2, and number 3. We ended up with 9 norms that the whole cohort (made up of four districts) all agreed to. We segued into, what I think, was the most important part of the day. This strategy is the way I think about almost everything that I do. In order to move forward with action or decision, one has to really understand why we are doing what we are doing. What is the purpose? Why does it matter? Why should people care? I think of Simon Sinek's book "Start With Why." Sounds so simple, but a lot of times we gloss over the 'why' to get to the work/action. We spent some time reflecting on keywords that went with Social Justice, examples of SJ and non-examples of SJ. In the end we had to come up with a definition for SJ. This reminded me a lot of my Philosophy for my Art Education course. I always remember two memorable things that my professor always said, "Frustration leads to learning!" and "What is your definition of [insert word]?" I was challenged with coming up with my definition for education, success, teaching, etc. Really defining what that meant to me. What it was for me wasn't what it was for everyone else and that was A-OK. I think this pairs with SJ. Everyone's definition is different. Just like every culture is different, but even though there are differences, there are so many commonalities. 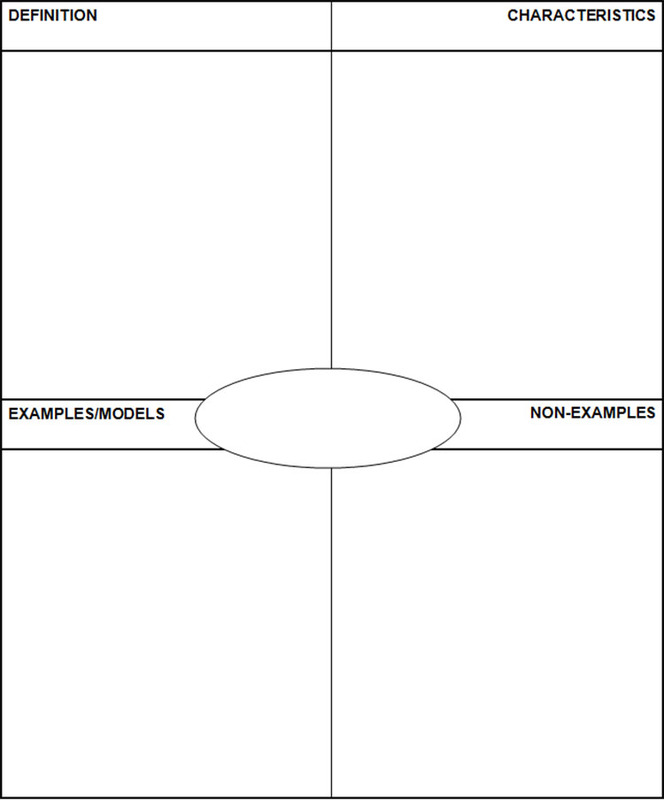 The 5 Whys is such an easy activity, but one that really narrows down to the core meaning of how you think about something. This can be used in the classroom for almost anything. I think it was eye opening for me because it really moved me to articulate a meaning. The question was, " Why is Social Justice important for our students?" Then you answered your first Why? And second, third, fourth and fifth until you come down to the core of the why. My why was... "Because ultimately, we want our students to be good to one another. We want them to be good well-rounded citizens." To me, it's about humanity. Your SJ definition will depend on why you feel SJ is important. Ah, now we meet our critical friend. You were supposed to lock eyes with someone from across the room and go over and say 'hey'. My critical friend is Radhika from Clarkston. We shared our 5 WHYS and then had to "double date" with two other people (an administrator from Oxford and our own Shawn LL). We were given a dice with talking prompts and had to share out. Oddly, it was one of the most difficult parts of the PD. I think it was because we only had 4 minutes to get through 4 prompts. Four prompts in which most people don't really think about on a day-to-day basis so for me, I needed more thinking time. Another activity that stretched us to think about our own personal culture was the cultural portraits. This would be a great activity for students and one in which we could incorporate with a relationships and identities lesson. We were given very broad directions on creating a portrait of our cultural identity. We finished them and posted them up for a gallery walk. Some were very design forward, others were wordles, some were mind maps, lists, pictures, etc. We found many differences (which is to be expected), but the commonalities were those of foundational values. Though we are different we value many of the same things regardless of cultural background. After we took our gallery tour we gathered to discuss portraits in groups of fours. We filled out the social identity wheel. 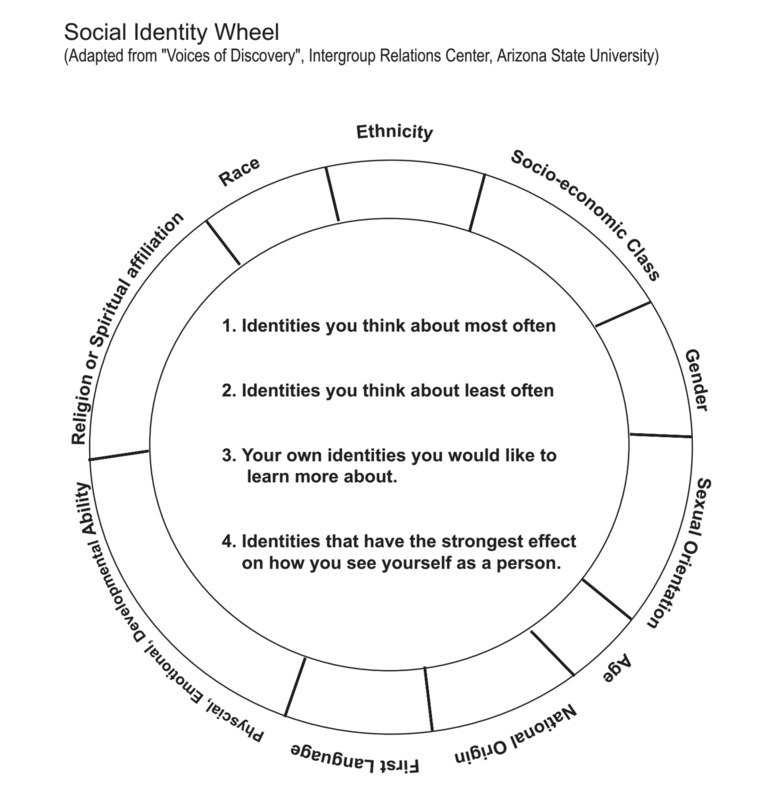 The idea was to become aware of how identity fits into being a social justice educator. Seeing a theme through these activities yet? The filling out of this wheel was super easy! After we filled it out, we our critical friend we were to talk about our wheel for 3 minutes straight. If you got done you weren't allowed to speak. You had to honor the 3 minutes. Sounds easy to talk about yourself for 3 straight minutes? Yeah... no. Actually, to me the talking was very easy it was the active listening for 3 minutes that was hard. The interesting piece was that you as an individual are processing while you are talking for 3 minutes. It's a deeply personal 3 minutes with your critical friend (who mind you... is a stranger). There is a sense of trust that you immediately share with this person. We ended with an elevator speech journal. It was meant to be something quick about what you learned through the day. Do you think that was the end? Of course not, we were tasked with finding someone and sharing out our reflection as well. Social Justice is deeply personal. It stems from the core of who we are. It's rooted in our own personal identities and this takes a lot of inner reflection, thinking, open-mindedness, and thoughtful processing. After the work we did at the workshop, it was a great reminder to note all of the commonalities and connections between all of us as people. Human beings. Why is it so difficult to talk about these things? Why is it sometimes so difficult to be good to one another? These are just questions to think about. I want to echo the message that has been sent throughout our district... there is more work to be done. I will leave you with a video Jay and Naomi shared with us.